With levity and wit, Meg Cranston investigates the intersections between individual and shared experience and how imagery and objects acquire meaning in our culture. Equally enamored of the diverse aesthetics of color theory, design, fashion, and supermarket advertising, she makes energetic collages pairing found imagery with monochromatic abstract forms. While often taking personal attributes or historical events as a jumping-off point, Cranston’s work is equally concerned with the formal language of art and the role the artist plays in helping us see the world in new ways. 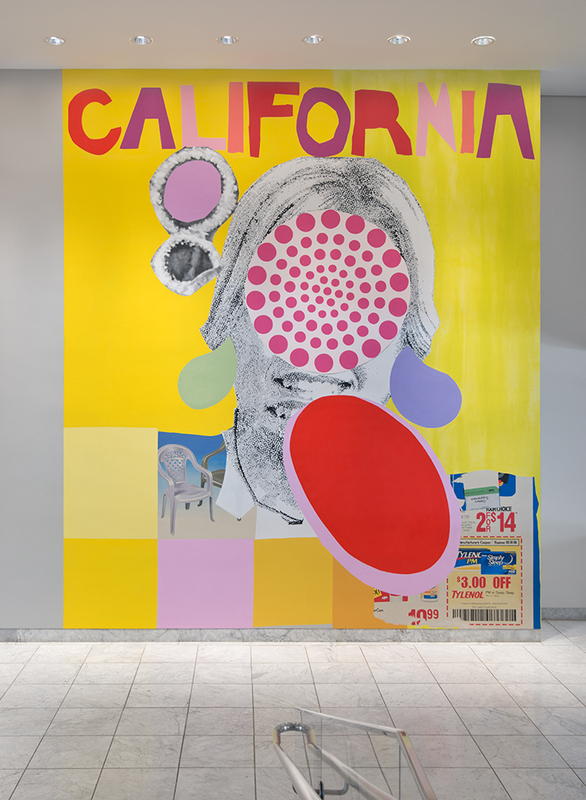 An iconic blonde California girl greets visitors from the east wall in California (Full Size) (2012). 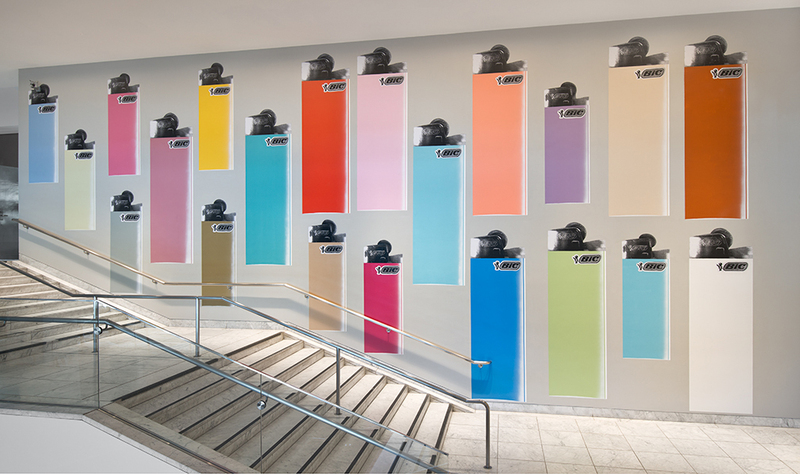 A playful nod to the notion of the artist as seer or mystic, Fireplace 12 (2012), on the north wall, borrows its colors from a spring–summer 2012 color forecast for fashion and home design. Symbols of the fire that they produce, the larger-than-life lighters conjure everything from rock concerts to religious rituals. 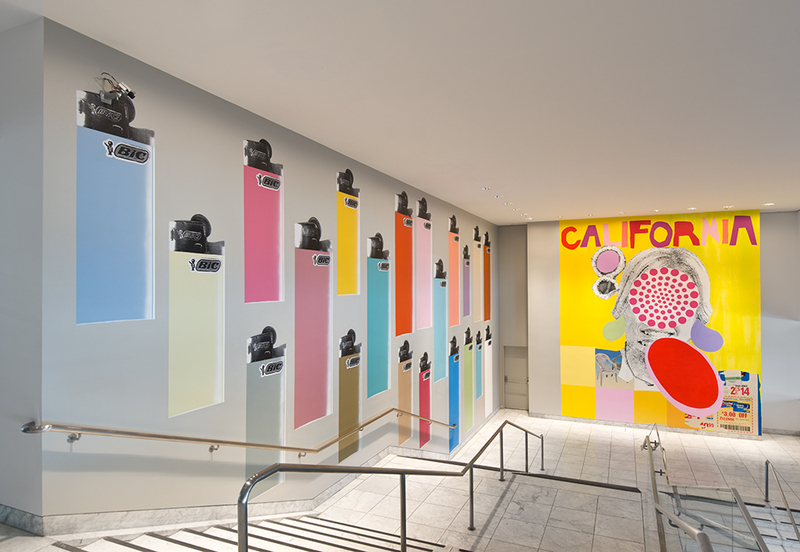 Commissioned for Made in L.A. 2012, the museum’s inaugural biennial of work by Los Angeles–based artists, the murals reflect Cranston’s interest in weaving together formal experimentation with recognizable cultural references, a strategy that she shares with many other artists in our city.